With school approaching those who have yet to drop out, we provide an alternative form of chaos: The Santafish Monthly! Where in the World is Common Sense? With school approaching, one member of our community has made sure you will be looking dapper when you first walk into those front doors. Conspicuous, AKA Tubby, has made several blog entries recently about fashion, most notably the entry titled yes american men can wear denim shorts. Conspicuous illustrates the proper way to wear denim shorts and adds that they give a summery look to the wearer. The entry has sparked controversy among many on the forum, many dissing its points. To his credit, Conspicuous has defended his remarks quite valiantly. Want to help the site? Check out the suggestions topic, which contains a movement to get Sal's Realm back to the older site look that appeared on the site from around 2004-2011. Many are familiar with a ring called the Ring of Wealth in RuneScape, which is a ring that boosts the chance of getting certain drops. The thing is that most people never understood how it works, until now. Check out the Ring of Wealth broken down topic, which should answer any questions you have about the once mysterious ring. Earlier in August the finale to the Plague City quest series, Plague's End, was released. It involves both the elves and the humans of Ardougne, with the main plot being the recapturing/reconstruction of Prifddinas. Reviews for this quest have been mixed, with some feeling it was rushed to make way for Prifddinas. While the crystal city of Prifddinas (which is Welsh for "capital") is a reward for this quest, it is not expected to be released until late in September (likely the 22nd), where the first half of the city is released, followed by the second half in November. Prifddinas is an update players have been waiting for quite awhile now and everyone is glad to see it reopened. 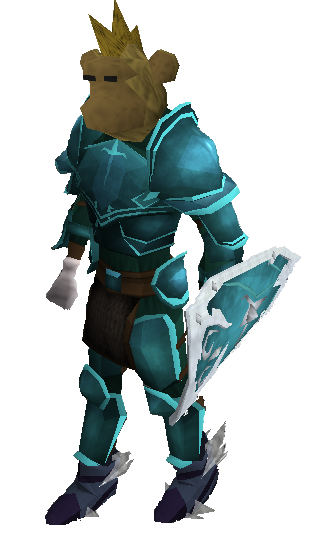 What also came with this quest was the redesign of all of the elves in RuneScape. The developers have changed the elves from beautiful humans with pointed ears (as seen in Lord of the Rings) to humanoids which seem to be part nature. As with any graphical update, this also has been met with mixed reviews. It is also quite clear that a few examine texts have been forgotten to be changed. Putting this aside, the graphical update seems to be ahead of the rest of the game. 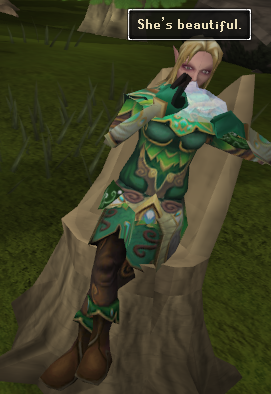 The highly textured elves look awkward in a game that is not nearly as textured. Perhaps with future graphical updates the elves will look more fitting in the game. And we'd like to say a thank-you to Jagex for giving our Plague's End quest guide a mention on the 8/21/14 Community Chronicle. 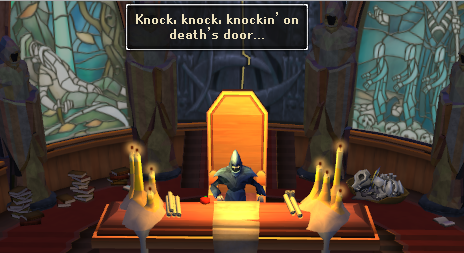 On the 18th, Jagex released a new daily system called Soul Reaper. With this update, the player visits Death's office, where Death will ask the player to collect a few souls of some high leveled bosses for him in return for some slayer experience and new rewards, including a new gem! Coincidentally, the release of an update which sent many people to dangerous bosses coincided with a large DDoS attack that lasted around a week. The attacks, which affected all versions of the game and numerous other games, caused many players to lose countless valuable items. This led to changes in several death mechanics. In RuneScape 3, gravestones were eventually extended by a large amount of time. Also, Jagex used a lost items policy, which allowed players to reclaim lost items during a server crash. Old School RuneScape, which does not have a gravestone system, allowed items lost on death to remain on the ground for 30 minutes. These new mechanics saved many from losing items, but unfortunately a lot of damage was done by this point. The attacks finally have stopped it seems, so if you should be able to go back to whatever dangerous activities you partake in. Here's a pre-tl;dr: You should almost never use the phrase "try and [verb]". If you're familiar with some other languages with origins similar to those of English, you'd know that English is a bit rebellious when it comes to infinitives. We often think of the word "to" as a preposition with its own significance referring to location and such, but it's also used to construct infinitives, in which case it doesn't really mean anything. It's just there. But it has to be there, for one reason or another. Incidentally, it is because infinitives must be formed with this combination of a consecutive "to" and verb that infinitive splicing is bad. Anyway, infinitives are used in plenty of grammatical contexts, but a simple one is "[certain verb] [infinitive]". Some verbs are very often used with infinitives. For example, "want". One might say "I want to eat." You might also use it with a direct object rather than an infinitive, as in "I want food." Quite seldom do we hear the word "want" alone, without an infinitive or direct object. "Try" is another of these verbs. You might say "I'll try to bowl." Or perhaps, "I'll try bowling." But there is absolutely no reason to say "I'll try and bowl." Logically, that sentence has two predicates, so you would just as well say "I'll bowl and try." Obviously, that makes about as much sense as "Colorless green ideas sleep furiously." 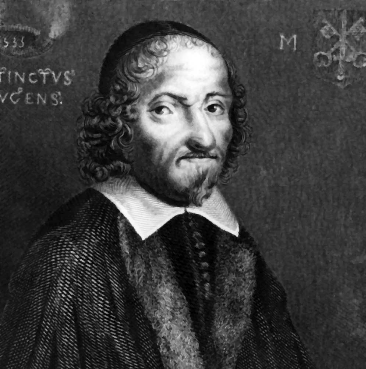 I took it upon myself to try to find an image of some English scholar guy looking disappointed in anyone who disobeys this rule, but the best option I found was Myles Coverdale. Renaissance painters were still experimenting with perspective, so shut up about his right eye. This upcoming weekend we are having competition 60. If you are familiar with our competitions you may have noticed that something is missing from this competition - the word skill. The reason for that is because this is going to be no skill competition. Yep, you don't need your eyes checked, this competition we will be competing in basketweaving! Well, this was the original plan, but it has since been changed to monster kills following a small uproar in the Runescape playing community. Check out the topic here. Many of you are aware of an old retired moderator named "Common Sense." Common Sense was for long a loyal member of our community, however he sadly left us last summer. Common Sense, along with being a good guy all around, was the owner of the citadel spreadsheet for quite some time. When he left, he gave the citadel to another respected clan member named Wilson, who has looked after the spreadsheet ever since. Our story takes a bitter turn on August 2nd, when the citadel spreadsheet became locked. There was only one thing that needed to be done to unlock it: one simple question had to be answered. As Common Sense was the one who created the spreadsheet, he was the only one who knew the answer to the question. After a few tries, the clan chat mods attempted to figure out what name Common Sense's best friend would have been. Christopher? Nah, a Christopher never would have fit with Common Sense's personality. David? Too common of a name. Archibald? Now, you may be onto somethi... wait nope. When it was decided that the chat mods would never have been able to guess the name of Common Sense's best friend from childhood, they took to finding Common Sense himself. Since Common Sense never checks Sal's Realm anymore, they had to find him in real life. Gocart took to interrogating the townsfolk of Common Sense's purported childhood home for clues. He was jailed three times after burning the buildings of any establishment which failed to cooperate. Micael Fatia took to the water, travelling across the oceans on a jet ski in attempt to find a boat Common Sense might be on. While doing this, he managed to defeat a ship full of Somali Pirates with only a handful of seaweed and two feet of duct tape. Bwauder took to the remote areas of the world to investigate if Common Sense had became a hermit. Bwauder's weird jokes landed him into a bit of trouble. Lilshu and Sobend began to track down Common Sense on Facebook. Lilshu made some progress, but Sobend got sidetracked into stalking "H0T GURLZ." In the end, the mission failed likely because nobody knew who the heck Common Sense really was. Thankfully, the savior in the story, Supersal69, has created a new citadel spreadsheet which can be accessed by clicking here, so you don't have to worry about not having your resources tracked. Check out the 2014 Clan Awards, which contains categories such as "Best Bosser," "Best PvPer," and "Biggest Noob." Here's some advice for returning to school, written by somebody who went to school once! If your college course requires you to own some ridiculously priced textbooks, here's a link that will help you find them slightly less ridiculously priced. It might be too late for you, but whatevers. Go throw a ball or something. Also, you should probably have pencils or something. This link has more information on that matter. The TI-84 Plus is one of the coolest graphing calculators in the neighborhood. But, you know, there's Wolfram Alpha and stuff, too, if you don't feel like paying $150.00 for what your $149.99 outdated laptop can do with 20x the RAM. Finally, you don't have to worry about that summer reading you forgot about, because you've read the much more professional Santafish Monthly! Random events were introduced with the release of RuneScape 2 as a means of detecting bots and reducing their effectiveness. In 2004, they were an effective way to accomplish this. As bots became increasingly sophisticated, they became less and less effective until they only served as a nuisance to real players. As a result, they were retired in 2012 and relocated to fitting areas around the world. Of course, Old School RuneScape, which precedes 2012 on the imaginary Old School RuneScape timeline, still has random events in all of their former glory. At least for the next few weeks, anyway. In the new developer blog, random event changes are outlined. In short, equipment breaking random events are removed, combat related random events are relocated elsewhere, and interacting with all other random events is optional. It’s not a complete removal of random events, but for all practical purposes they aren’t a significant part of the game anymore. You could choose to avoid them entirely if you’d like. Like all other Old School updates, it was polled and received an enormous amount of support. It will be hard to argue with Jagex for implementing this because of that, but there are reasons why it’d be a good idea to vote no. For starters, they serve as an occasional distraction from the mindless grind leveling in RuneScape is. They can be rewarding, too. They are one of the main sources of gems, both uncut and cut, and the gem rewards are larger in Old School Runescape than they ever were in the live game (it is possible to receive four noted gems). Random events such as tree spirits can drop rune axes, and the very rare shade random event can drop shade robes which look exactly like priest robes, but hey, they are fun to get! I know what you are thinking. “I don’t know man; I kind of just want to do my own thing without interruption.” Well, random events still can offer you something too. Not all bots are sophisticated. The simplest version of a bot, the auto-clicker, is far from able to handle random events. Believe it or not, people still use these. They’re easily detectable by the bot catcher, but there are instances when players have not been banned for auto-clicking. 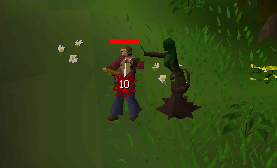 Random events also force bots to be sophisticated: a player with minimal experience cannot make a bot because of them. In addition, they are part of the nostalgia associated with Old School RuneScape. Most veterans are over that by now, but it is an attraction for new players. Lastly, and most importantly, they penalize AFKers. Now, I don’t have a grudge against people who don’t want to pay full attention all the time. However, AFKing for up to six hours while you play football with friends is not in the spirit of the game. With the removal of random events, it will be possible to splash combat spells on low leveled monsters for up to six hours until you are forcibly logged out. This is currently possible on PvP worlds, but there is always a chance something will go wrong and you will get PKed for thousands of runes. Obviously, now you will be able to do it on any world. Whether you support the removal or not, I’m sure everybody will miss watching the Sandwich Lady whack a poor guy who isn’t paying attention to Ice Mountain.